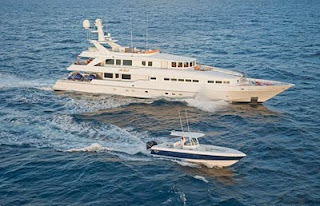 After a 2 year retrofit, At Last Luxury Yacht is available for charter in the Bahamas at Special Rates! 2 weeks for $187,500 and 3 weeks for $250,000 (all rates are plus all expenses)for bookings completed before the end of May. At Last is virtually a new yacht after completing her 2 year refit. Her KaMeWa water jets and shallow draft make her ideally suited for the Bahamas and Florida Keys. She is the perfect family boat with an incredible array of toys. Full beam Owner's Suite is located on the main deck forward with centerline king size bed and offers a panoramic view or complete privacy with custom, fitted electric blinds. Comfortable seating, desk, two walk in closets and full entertainment system complete the area. The master bath features 2 sinks, a large Jacuzzi and huge shower with rain shower overhead and 3 wall fitted shower heads. On the lower deck are 4 guest staterooms: 1 King, 2 Queens and 1 Twin with additional Pullman berth, the doubles have ensuite bathrooms with showers and the twin has a Jacuzzi tub with shower. Semi circular lobby on the lower deck offers refrigerator drawers for the guest’s convenience. It is also the lower end of a central winding staircase connecting all 3 decks. On the main deck it divides the octagonal shaped main salon from the dining area and continues on to the bridge deck and sky lounge. Here is a full wet bar with stools, comfortable seating and sliding doors with access to the aft deck dining and seating area. Up one further level is the spacious sun deck with Jacuzzi, ample lounging space, BBQ, bar, lounging and yet another table and chairs to seat up to 10.